This entry is part 5 of 9 in the series CheeseWeb's Asian Adventure 2013. 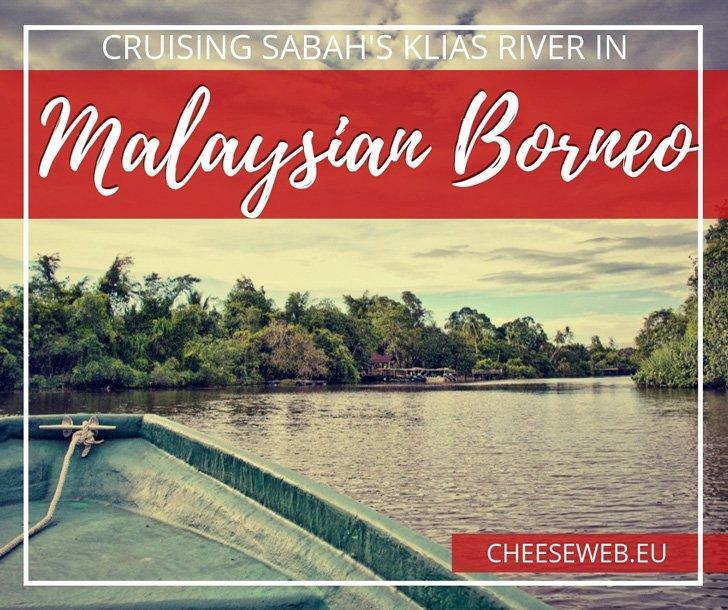 Want a full day trip from Kota Kinabalu, Malaysia to discover Borneo’s nature? 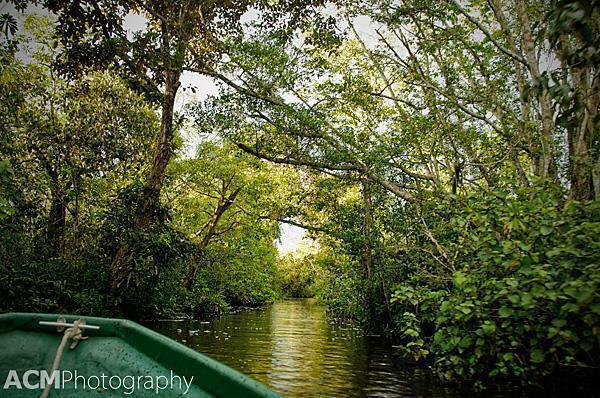 A Klias Wetlands river cruise is the perfect way to see proboscis monkeys, macaques, lizards, fireflies and more. 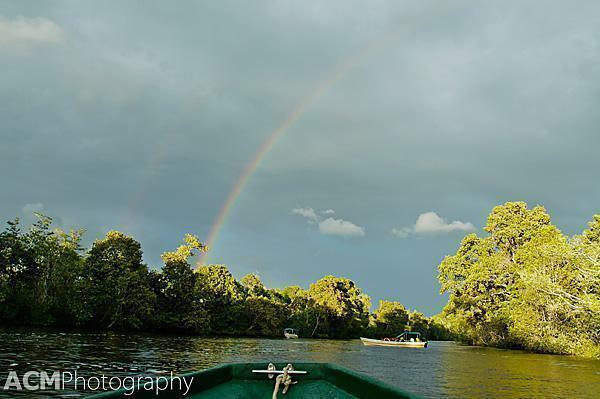 Our trip to Sandakan to see the orang-utans inspired us to discover more of Sabah’s wildlife. 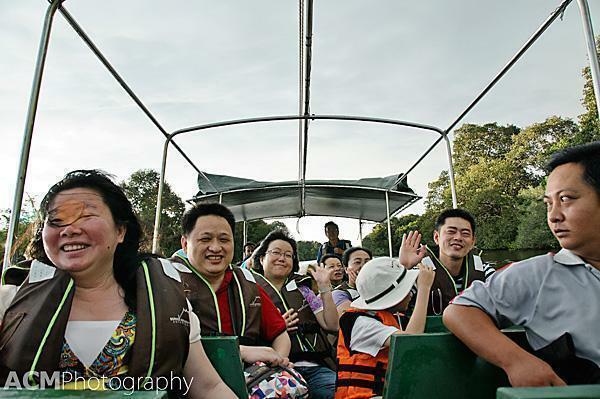 From our base in Kota Kinabalu, we arranged another primate-themed day-trip from our base in the Horizon Hotel. 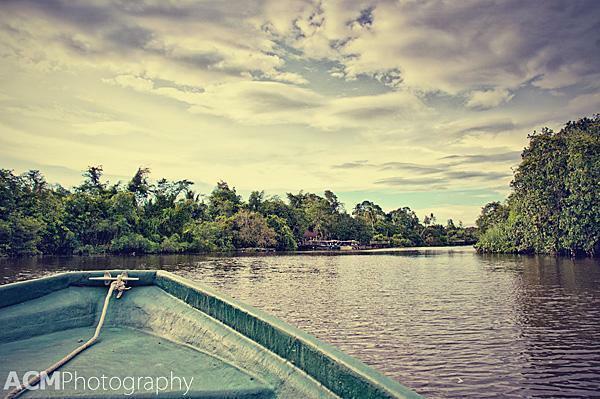 We would cruise down the Klias River searching for Malaysian Borneo’s other famous inhabitant, the proboscis monkey. After several hours driving through the lovely countryside, we arrived at the Klias River, where our intrepid guide scored us front row seats on our small boat. Front row seats for cruising the Klias River. A group of Chinese tourists filled up the rest of our vessel. Only a few of them spoke English, but everyone was friendly and happy to smile for a photo. It wasn’t too long before our captain spotted movement in the trees. 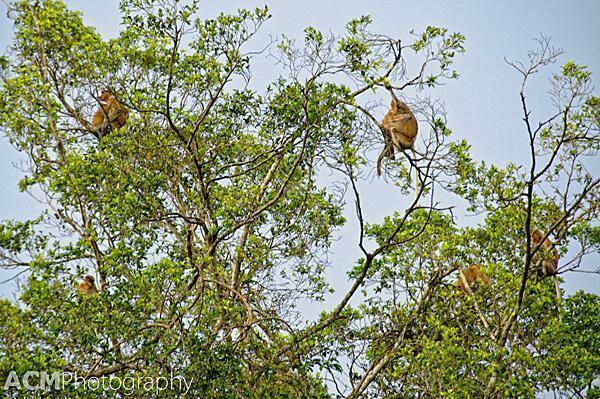 The proboscis monkeys are quite shy, so we had to look way up to see them in the treetops. Look up. Look waaaay up. 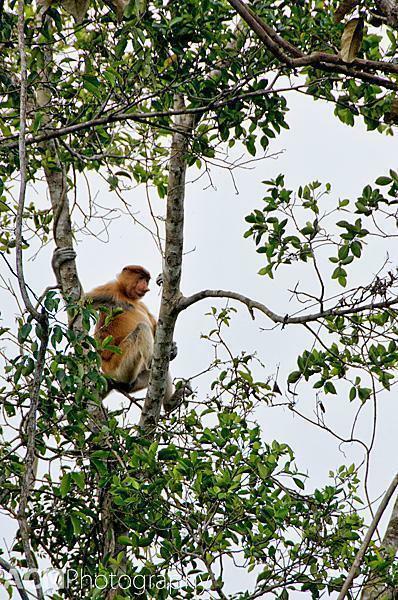 And you may spot a proboscis monkey. Mama and baby proboscis monkeys. 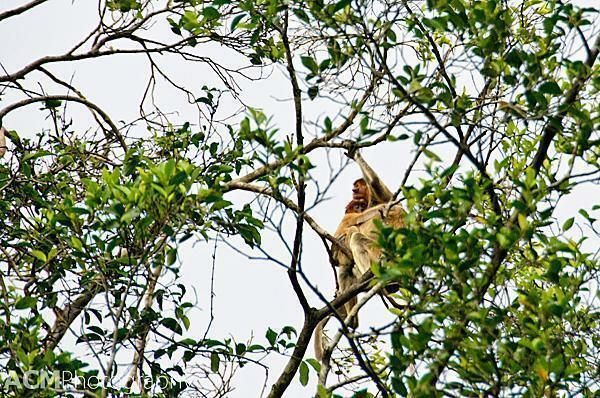 There were at least a dozen individuals in this family group of proboscis monkeys. 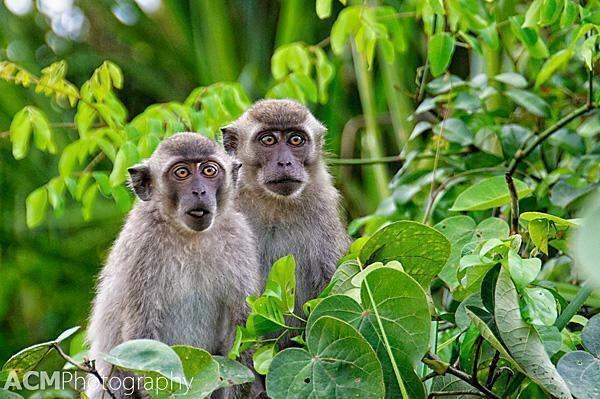 The proboscis monkeys aren’t the only inhabitants of the Klias wetlands. 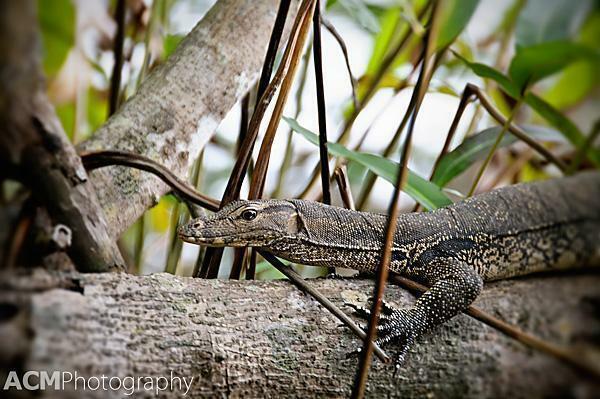 Our captain spotted this monitor lizard sunning himself on a log. This lazy lizard wasn’t bothered by our presence at all. 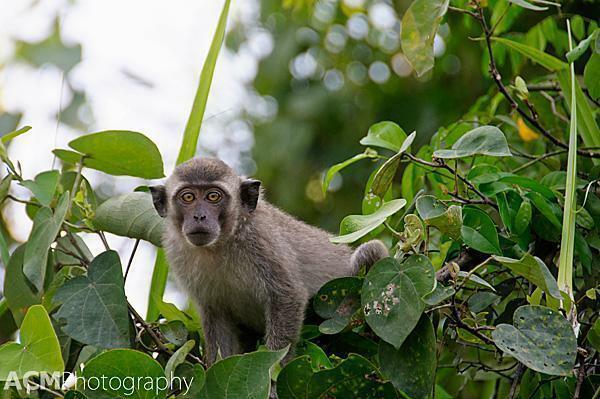 By far the friendliest and most inquisitive monkeys on the Klias are the macaques. These guys couldn’t wait to climb down and check out our boat. 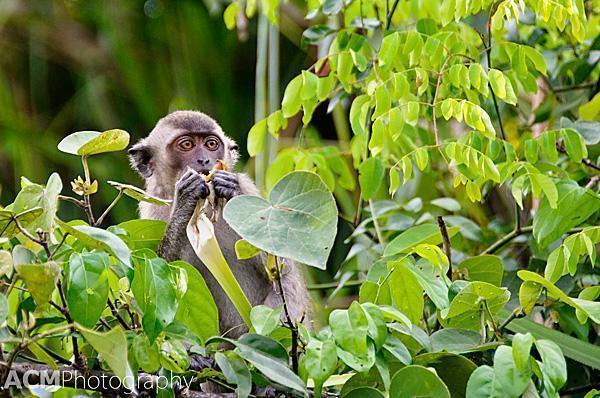 This macaque is enjoying the local produce. 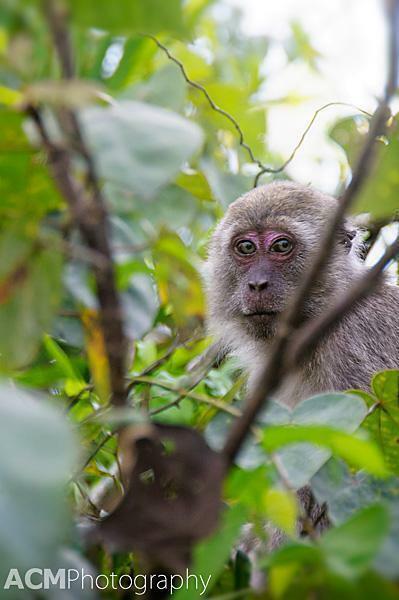 Monkey spotting on the Klias was a great way to pass the afternoon. 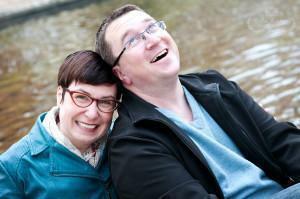 On our return back to our dock, a spontaneous rain storm did its best to soak us. Fortunately, it didn’t last long, and we were treated to a brief but beautiful double rainbow. Then it was back through the trees to return for a Malaysian buffet dinner.